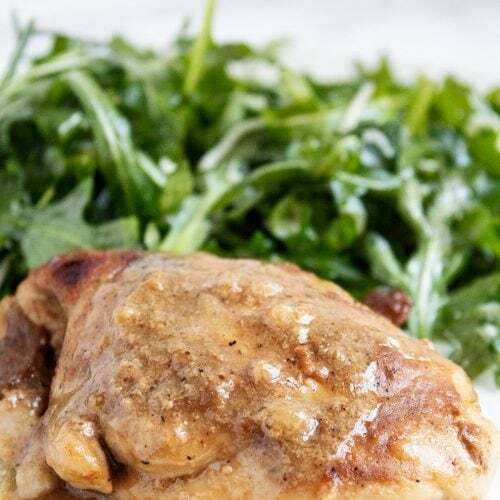 These keto and low carb Maple Dijon Chicken Thighs make for a satisfying dinner that the whole family will love! They are sweet, a little tangy, and oh-so-moist. 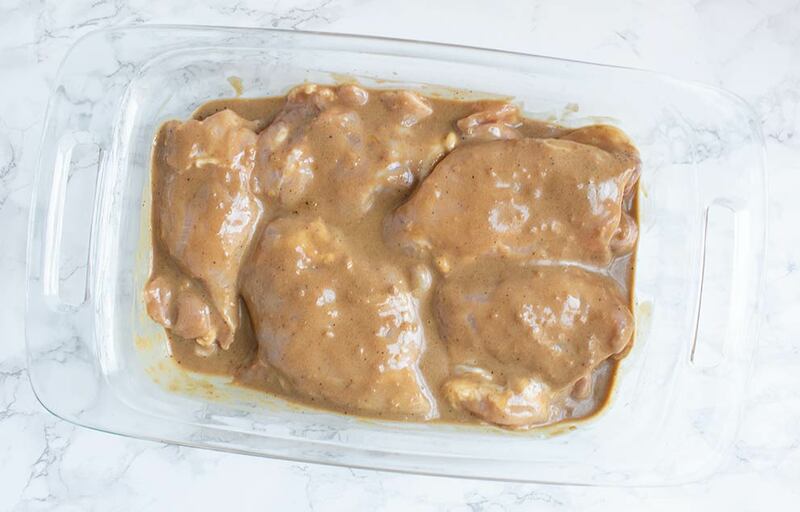 You’ll definitely add these keto and low carb Maple Dijon Chicken Thighs to your weekly dinner rotation! They are incredibly easy to make, moist, and bursting with flavor. Ready in only 45 minutes, they are perfect when paired with a healthy low-carb vegetable side. Lakanto Maple-Flavored Syrup: Stock up on a bottle (or five) of this… it is heavenly! 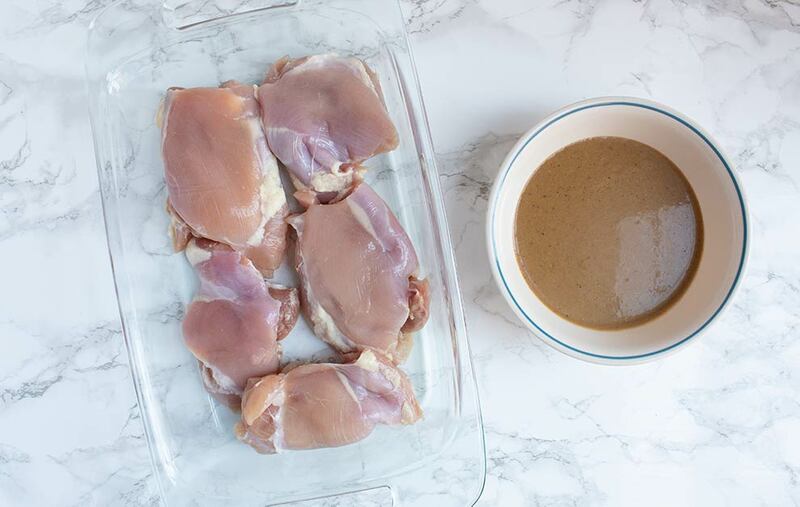 Anthony’s Xanthan Gum: A keto kitchen staple perfect for thickening sauces, soups, and drinks. One bag will last a long time, so it’s worth the (small) investment. 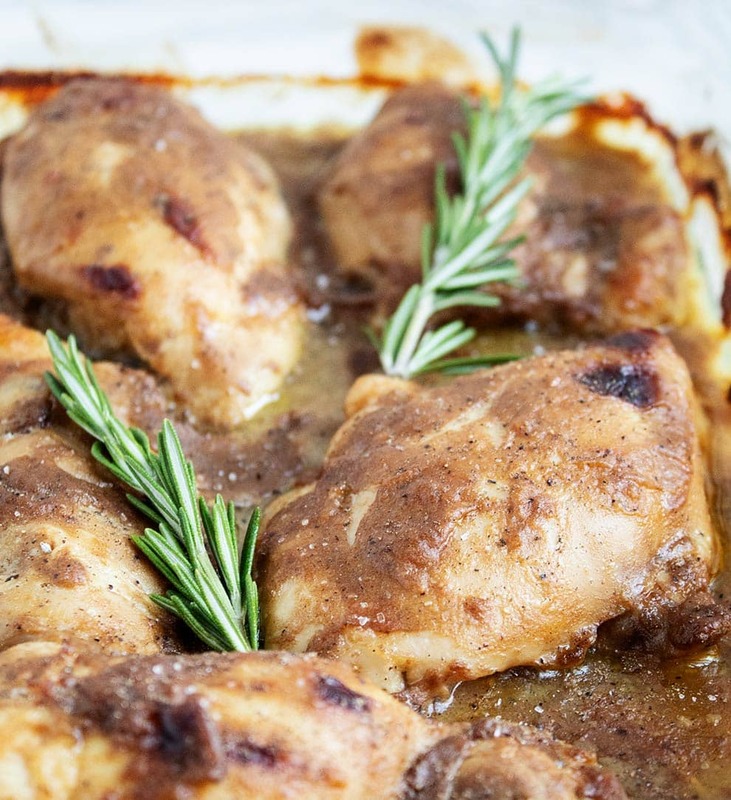 Step #1: Preheat oven to 425 F.
Step #3: Add chicken thighs to a 7″x11″ glass baking dish. Pour mixture on top of chicken and turn chicken to coat it evenly. Step #4: Place baking dish in oven on the middle rack. Roast 35 minutes or until internal temp of chicken thighs reaches 165 F. Chicken should be nicely browned on top. Step #5: Remove chicken from oven and cover pan with aluminum foil. Allow chicken to rest for 10 mins covered, then season with fresh rosemary and additional salt and pepper to taste. Step #6: Serve with some of the pan sauce spooned over top. Enjoy! 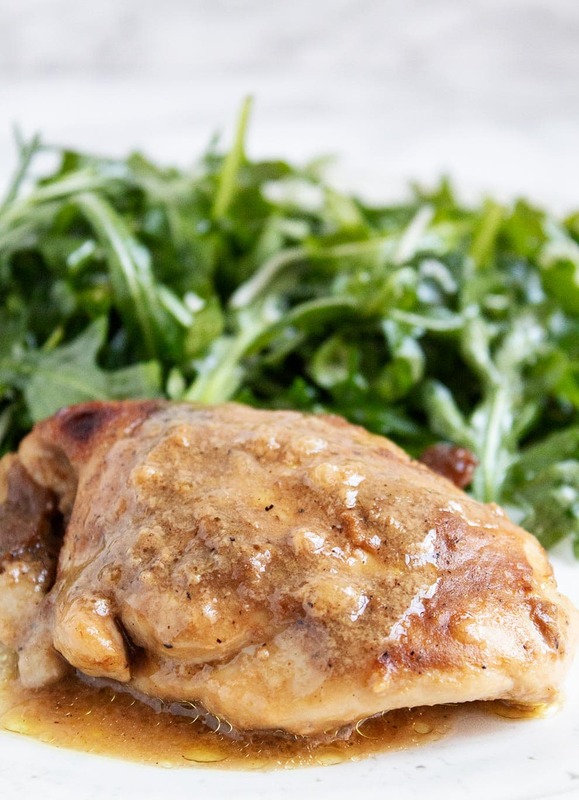 Since these chicken thighs are relatively low in fat (only 7g per serving), they are excellent paired with a vegetable side with butter or olive oil. I served them with an arugula salad (arugula, olive oil, salt, and pepper) in these photos, but they’re also super tasty with cauliflower rice cooked with butter and your seasonings of choice! 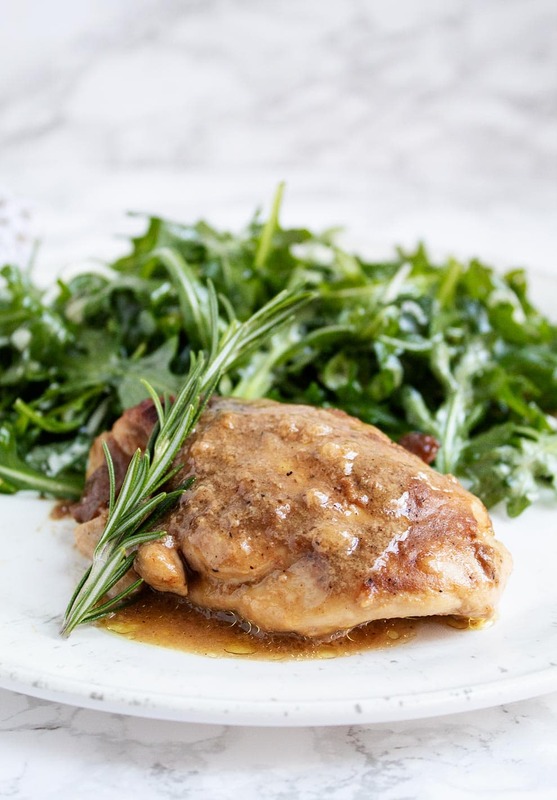 These chicken thighs would also be great paired with a Keto Cornbread Muffin. 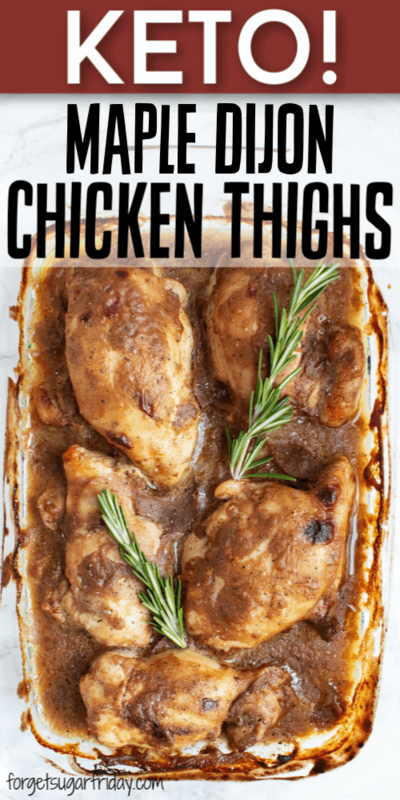 I hope you love these easy keto chicken thighs! If you liked this post, I would so appreciate you giving it a share by using the social sharing icons. THANK YOU! Whisk together ingredients in a small bowl. If you're using xanthan gum (highly recommended), sprinkle evenly over top before whisking (do not add in a clump). 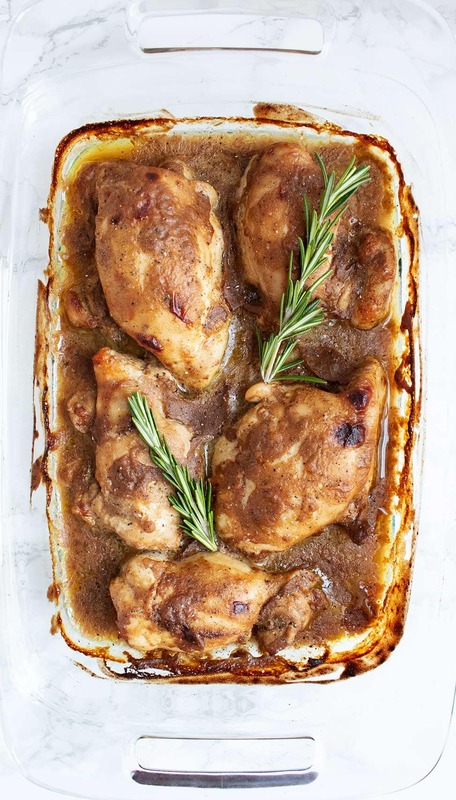 Add chicken thighs to a 7"x11" glass baking dish. Pour mixture on top of chicken and turn chicken to coat it evenly. Place baking dish in oven on the middle rack. Roast 35 minutes or until internal temp of chicken thighs reaches 165 F. Chicken should be nicely browned on top. Remove chicken from oven and cover pan with aluminum foil. Allow chicken to rest for 10 mins covered, then season with fresh rosemary and additional salt and pepper to taste. Serve with some of the pan sauce spooned over top. Adjust dijon mustard based on your preferences. In my opinion, 4 tbsp dijon gives this recipe the perfect sweet-tangy mix. However, if you aren't a big mustard fan, try using only 3 tbsp for a sweeter chicken without the hint of mustard. Recipe inspired by a few non-keto versions like this one and this one.